Now to September 1st, I invite you to come by the Los Olivos Café & Wine Merchant to view my art. The paintings selected for this show reflect what I love most about this region: vineyards, lavender fields, sunsets in the rolling hills of the Central Coast, rustic barns at the base of mountains basked in the red, late afternoon sunlight. And the Cafe's baked brie is incredible! 1. Explore the local art scene. Los Olivos has wonderful sculptors in addition to accomplished painters. Wandering around is richly rewarded. 2. Wine tasting! Dozens of wine tasting rooms line the two main streets, Grand Avenue and Alamo Pintado, but I would also encourage you to explore the side streets. Which is my favorite? I can’t say (there are so many), but Dragonette Cellars and Carina Cellars are on the list. 3. Find the hard-to-find wine. Los Olivos Café & Wine Merchant sells some of the most difficult to find wines in the area. It’s well worth an exploratory walk-through (and you’ll see my paintings on the walls too!). 4. Have breakfast. Two hidden breakfast spots deserve a hungry traveler’s attention: Corner House Coffee on the corner of San Marcos and Alamo Pintado (best for coffee and a quick bite), and Los Olivos Grocery just up the road on Highway 154 (gourmet breakfasts on the patio and local, organic groceries to take home). 5. Picnic in the lavender fields at Clairmont Farms. Here’s what you do: Order Panino’s sandwiches to-go (best sandwiches on the Central Coast! ), drive (or walk) the one mile to Clairmont Farms, and picnic in the midst of 5 acres of lavender. 6. Enjoy Cupcakes. Just look for the vintage tear-drop trailer for the best cupcakes in town. 7. Have dinner. With great wine comes great food, and Los Olivos is no exception. Los Olivos Café, of course, is one of my favorites. Mmmm brie. 8. Come on August 16th for the 28th Annual Los Olivos Quick Draw & Arts Festival! Watch local artists start and finish paintings in just one hour, and bid on your favorites at the live auction. While I won’t be part of the “Quick Draw,” I’ll be there demonstrating oil painting from 2pm to 5 pm. The whole event is at Mattei’s Tavern from 9am to 7pm. 9. See the sights. 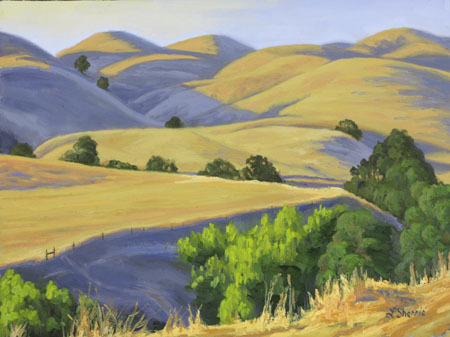 I’ve painted several views around Los Olivos, and I encourage you to see each one for yourself. The ancient olive trees shading the entrance to Clairmont Farms, their lavender fields and the majestic Figueroa Mountain range (drive as far as you can go up Figueroa Mountain Road for the best vantage points). 10. Come to my summer art show going on now to September 1st at the Los Olivos Café! reproduce this newsletter in any form.